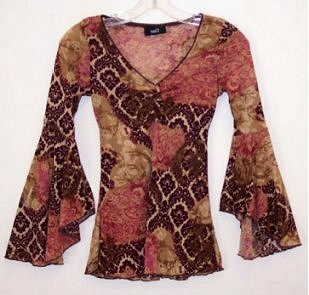 This is such a delightful reproduction peasant blouse. It is for a very tiny adult or a an adolescent though. It is about a size 0. The darkest color is actually a very deep wine or burgundy color, not brown. The other colors are tan, beige and a lighter maroon color. The blouse is made of an extremely thin almost sheer stretchy polyester. It's light enough to we be worn during summer weather or to a hot party. The chest of the blouse would best fit a 27" - a 32" at most size. Again this blouse is probably meant to fit a short petite person, probably someone 5' tall or shorter and 100 pounds or less. There is a back tie for a custom fit. The blouse should be hand washed as it is somewhat delicate. It will not shrink. Size 0 and size 2 pants available upon request if not listed yet. Priority shipping is used in the USA. Delivery is generally 3-10 days. Item is exchangeable. Complete returns must be approved and buyer pays all shipping and 4% restocking fee. The blouse is exchangeable or returnable if it does not fit and with approval except during 10/12 - 11/04. Buyer would pay all shipping costs and a 4% restock fee if not exchanged.